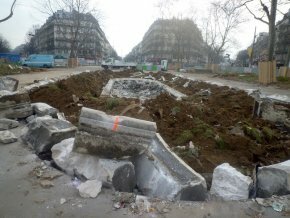 Repairs take place only as emergency calls : the stones are falling from the façade of Saint-Paul-Saint-Louis ? The work is done because there is no other choice. The rain is leaking inside Saint-Philippe-du-Roule ? A makeshift cover is put up in haste which is sure to last for years. 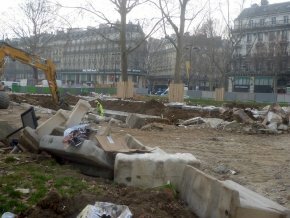 How many churches could have been restored with the funds budgeted for vandalizing the Place de la République ? We had started a series on Parisian places of worship. Without overlooking some rare instances of restorations in progress or recently finished (we will soon discuss the Chapelle des Ames du Purgatoire in the church of Sainte-Marguerite), we will soon continue our visit of "renovated" churches, in fact seriously threatened, quoted by Mrs. Pourtaud. We did not know the name of the artist who produced these fountains. 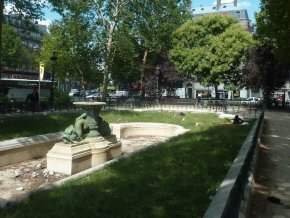 The website e-monumen has posted a report on it stating that the architect was Joseph Bouvard, the successor of Davioud.